Few topics in the automotive repair business are as controversial and confrontational as the fee for a diagnosis. Should a customer have to pay for the time the mechanic spends figuring out what is wrong with a vehicle or only for the repairs he or she actually makes? These days, don't technicians just plug the car into a computer to figure out what's wrong? A customer dropped his vehicle off at our shop last week. He wanted us to find out why his power seat would not move forward. We removed the side panel and tested the wiring and electronic motor circuits. A few more pinpoint tests led us to the problem—a faulty seat switch, which, with parts and labor, totaled nearly $170. The customer declined the repairs and asked us to reassemble the seat. When we handed over the bill for the diagnostic charge, he refused to pay, saying, “You just told me that my seat was broken. I already knew that.” In his mind, we hadn’t told him anything he didn’t already know, so he didn’t understand why he should be charged for anything when no repair was actually performed. The manager of the service department where I am employed once said something to me that best clarifies and sums up our position—“We sell service.” Because service is not really a tangible item, it often doesn’t appear to have intrinsic value. But anyone who has experienced bad service knows how crucial good service can be. Sometimes it’s difficult for a customer to understand the value of a technician’s time. At a grocery store, a pound of prosciutto ham and a gallon of milk have inherent tangible value that’s reflected in the price. You pay money and you get to take it home. But service in itself isn’t something you can take home—it isn’t something you can hold in your hands. But let’s say you are in therapy. After an appointment, you would never refuse to pay because you didn’t get the results you were looking for. We pay experts for their time, training, and the skills they have acquired—no results are guaranteed. Many customers balk at paying diagnostics fees, especially when it comes to trouble codes. Often customers think that the simple reading of a trouble code (which takes less than five minutes) completes the repair process, when actually, it’s just the beginning. For example, the P0503 code, which indicates a malfunctioning vehicle speed sensor, has forty-one steps spanning eleven pages in a shop manual after the code has been set. Examining those forty-one steps takes time and expertise to examine—shouldn’t the technician be paid for that time? Ultimately, it really is less expensive to pay a qualified technician for a proper diagnosis than it is to replace components based on a hunch of what might be wrong. They may have dirty fingernails, but some senior master automobile technicians actually have as much training as medical professionals—why should their time matter any less? I have never understood why I had to pay someone to tell me what was wrong with my car when I already knew what was wrong. Now that you have explained it I completely understand. Thank you! I don't have a problem paying for service but when you hook a machine up to run a diagnostic test to search for why the service engine light is on. Should it cost $100.00? @jonelsr - This isn't much different than a doctor providing a cat scan or a dentist taking x-rays. The test should be seen as part of the service, but the real value comes from a professional examining the test results. You wouldn't want me looking at your cat scan and providing any kind of diagnosis, nor would you want a doctor telling you why the check engine light is on. Both require years of experience to properly read and interpret the results from such equipment. So in the end, you are paying for a service, along with expensive equipment and personnel training. as much as medical personal when you go to school for 14 years after high school pay a half million for a educaation and a quater million for yearly liability insurance then you can compare yourself to someone whom actually is regulated by state and fed laws.Sounds like you want to be paid for a estimate, if you cant find out what is wrong in a timely manner why should yhe customer pay for your incompetance? Brian, Thats a great analagy of paying for service that everyone should understand. You know the difference between a doctor and a technician. Doctors get to bury their rechecks. I run a Mobile Auto repair biz and my customers ask this question all the time. My answer goes something like this: If you dont know what the problem is and the problem is not immediately apparent to me , and takes me time to run down the source, then yes there is a charge. However if you dont want me to charge you a diagnostic fee then #1 you tell me what is wrong, #2 tell me what part to change. If its the wrong part then thats on you and you still have to pay me for the work...and dont forget that part you didnt need. An estimate and diagnosis are two completly different things. An estimate is something that you the customer already knows is wrong with the car and can simply be looked up in a book and figure out a cost. If you choose to replace the part without it being diagnosed and it doesnt fix the problem who is to blame? We try to cover our basis. Some items you simply cannot diagnose for free. Scan tools cost alot of money and the ones at parts stores are much cheaper and can only retreive a code. From thier they try to sell you all the parts that could be wrong. Now why would you want to buy all of those parts put them on and not have your problem fixed? Why not pay someone 38-77 dollars to diagnose the problem and know exactly what is wrong. If warranty work is being done, shouldn't diagnostics be covered? Warranty work doesn't always include diagnostic fees. 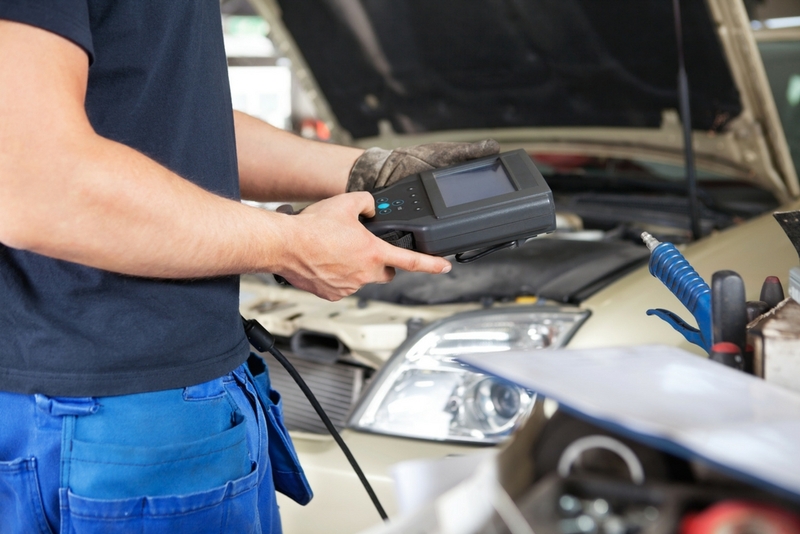 Aftermarket warranties sometimes require you to pay the diagnostic fees. Manufacturer warranties will cover the diagnosis charges. When you go to a place like Auto Zone and they run a scan with a small $50 dollar scanner that's what I call a "quick and dirty" scan. It gives you just about enough information to be dangerous. I believe that this type of "scan" should not cost the customer. Conversely, I believe that the customer should be charged for diagnostics when you use a scanner that costs $10,000.00, takes twenty minutes to set up and calibrate and can test 4273 different processes on your vehicle. The real reason for having your vehicle scanned is to ASSIST the diagnostics person in identifing and correcting the problem without guessing or replacing parts until the problem is corrected. Correcting the problem also depends on the knowledge of the person running the scanner to correctly interpert the information. Case in point: I recently had a customer bring in a BMW that another shop had done $3500.00 worth of work to and according to the customer, the vehicle still had the same problem. The "scanner" had said to replace coil packs, and multiple other components, all of which totaled $3500.00 which the "other" shop did. Upon my "scanning" the vehicle, multiple codes were present which indicated that several components needed to be replaced including the coil packs. The REAL problem was $25.00 worth of vacuum hoses which when replaced, corrected his problem. A scanner is no more than a "tool" that assists the diagnostics person in making the correct decision which ultimately costs the consumer less in the long run. ANYBODY can repair even a persent day vehicle if you replace parts until you correct the problem. I have been in the automotive business since 1965 and have lived through the transition of vehicles becoming a rolling computer. While the scanner is a helpful tool, it is just that... a tool and should not be considered "always right." You would be supprised at what the scanners don't know. ok i have a diagnostic done on my car and i paid the $100 to get it. Now can i take that diagnostic report to different mechanics to get the best price for my repairs? I dont have a problem paying for accurate diagnostics. i object to having my car 'hooked up' and then being told after the analysis that the fuel injectors need replacing, but it may also need a fuel pump as well. Surely the diagnostics machine can tell what needs doing?? Or am I being simple? ...and if you have a dodge you can utlize the self diagnostic procedure by turning the ignition on and off 3 times in a row, then turn it on again. When you do this the odometer displayes the error code. You go to the internet type in the errorcode and it will tell you the part that needs replacing and print it our for your friendly helpful mechanic. Saves a $100. I'm fine with paying for their time even if I opt not to get the work done there but not if they tell me that they can't determine what the problem is. Its their job to find out. I had a check engine light on and the diagnosis came back with an error code on a heater O2 sensor. Then they told me to go drive it for 50 miles and return so that they can get a reading on the 3 other sensors. I drove 200 miles, and still no answer except to go out and drive some more and come back again. To me it seems that they don't want to take the trouble to investigate what is blocking the information flow from the other sensors getting to the onboard computer. Instead if I drive it around enough, maybe something will "come unstuck" and get the results they need for a complete diagnosis. Why should they bother to do the hard work if they expect to get $90 for an incomplete diagnosis anyway? I have a complete understanding of the value of your time for a completed service. In the case you describe you were able to diagnose the problem, why the seat was not working. A diagnostic service was rendered. But what about when the mechanic does not diagnose the problem? I consider that a failure to perform the agreed upon task. I should not have to pay for someone to not figure out what is wrong with my car. My car is currently in the shop because the battery keeps draining. I brought it in with a dead battery and asked them to find out what was killing it. Without any diagnosis of what was wrong they are returning it to me.... and charging me for a diagnosis. In my opinion that is a breach of our agreement and I should not have to pay. If they told me what was wrong and I chose not to fix it I would have no problem paying. How much effort would you put in at work if you weren't getting paid? An hour's diagnostic time up front should have been properly explained and agreed upon. I tell my customers that within an hour's time I will either have the problem diagnosed, or at least a good idea whether I'm getting somewhere or it's out of my league (rare--but happens). If a problem can't be found in an hour (common with electrical) that doesn't mean the tech shouldn't be paid. He has ruled things out in this time and made headway. Ask the tech for a wiring diagram for the system he's working on, maybe you'll have a better understanding of what you are paying for. Intermittent problems are very, very tough to track down. What technician will work on a car if he knows beforehand that if no problem is found--he doesnt get paid? If a customer were to tell me they do not want to pay unless I can ensure I'll find the problem--I can respect that--I can understand that--but we won't be working on your car. (Of course, again, I have many regular customers that I will absolutely bend over backwards for--we have earned each others trust and I know they aren't here to waste my time or theirs). Try that next time at the doctor-- tell him something hurts but he's not getting paid unless he finds the problem. Tell him all his lab work, xrays, and experience doesn't qualify for payment until you are better. When he prescribes treatment or drugs, and it doesn't work-- is there a warranty or is he getting paid for further diagnosis? I am lucky to be very busy so I can't afford to diagnose (or attempt to diagnose) things without payment. For every person that doesn't see our time as valuable, they open a spot for the next vehicle owner who does. Remember, I'm talking skilled technician diagnosis--not visual inspection of brakes/undercar/underhood by a general service technician. The beautiful part about all of this--customers can go whereever they want--go to the place that meets your needs and stay with them. Like any other business you will most likely be rewarded for your loyalty and you will build trust. Jump from shop to shop for the freebies and coupons and you've got more patience and time on your hands than most.. Best of luck. I wonder if police officers/detectives get paid when they don't solve a crime? The person that mentions a doctor can't be compared to a technician?? Are you serious? You're right--not many techs drive Mercedes/Lexus/BMW; have summer homes and boats, etc. A tech's education is never-ending! 14 years of education for a doctor? I'll take it! I'm 20 years in and now have to learn about electric cars, new diesel technology, hybrids, etc. I'm not complaining, I'm passionate about it and love cars--I love learning the new technology. I just don't work for free. Cars are getting more and more complicated while the human body stays the same! What do you think it costs for insurance and liability at an auto shop? I pay every time I go to the doctor, even when it's for the SAME THING I was there for a week before. Another copay, more prescriptions, another "guess". To the gentleman who wanted Ford to put a thermostat in.. This happens often. A customer "diagnoses" their own engine light/trouble code. They go to the super-smart internet and figure out what it needs. Then they want someone to replace something based on internet diagnosis, yet be fully liable if/when that doesn't solve the problem. You can't tell me (and if you do, I won't believe it) that if Ford replaced the thermostat like you asked and your engine light returned, that you wouldn't be right back there telling them they must have done something wrong. They will tell you they didn't diagnose anything, they just did what you asked; then you will yell and scream and get your way telling them that they are the experts and they shouldn't have listened to you, you don't fix cars! Now a tech has to spend his time diagnosing the problem(s) for free because the customer is stomping his feet. Ford was very smart to not go off of your diagnosis (and I know you may have paid $91 for them to tell you, yes, its the tstat). Better you hate them for not running their business the way YOU want them to than you trashing them for charging you and the problem not being fixed. Someone way before you did that to that dealer, and that's why they said "no more". If a shop owner wants to charge a door fee to step inside and consider becoming a customer, more power to him. He is the only one in a position to make that call. On the other hand, if I buy a new car and button stops working while under factory warranty, I sure as hell am not paying a diagnostic fee to a dealer before they will even look at it. I don't care if the fee will be waived in the event the problem is covered. The risk is on them, not me. Period. They're not going to pay for a button that stopped working when they discover you had a remote start installed at Best Buy that interrupted the circuit, or your kid jammed a grilled cheese sandwich in your dvd player. My mother bought a brand new Camry in summer of 2005 and went back to dealer that fall because the heat/blower had stopped working and there was an odd smell. The car had about 2500 miles on it. They brought her out and showed her a mouse had made its way into the blower box and brought all sorts of debris into the blower wheel. The dead mouse was in the wheel and that was the smell. She had to pay for the repairs. Of course she was not happy but at the same time how is it Toyota's fault? Mice can get into almost anything--its not an engineering fault. The tech that fixed the car--not his fault either--he should get paid. They gave her a break and the bill wasn't substantial-- but this is why they secure time up front--in the event of something like this. Had my mom told them to not repair the car, they would have justifiably collected for their time and moved on..
As a service manager of a shop that openly charges for diagnostic, one thing that I wish is that consumers would understand is that when they get lured into a shop that offers free diagnostic one of two things is really happening. Either they are not really getting a proper diagnosis (ie: check the code then throw a part at it as a guess) or if they are getting a proper diagnosis THEY WILL IN FACT PAY FOR IT. It is common practise for places to add one hour of time to the repair estimate. So for example replacing X part would normally cost 2 hrs of labor so they actually charge 3 to cover their diagnostic time then still claim they didn't charge diag! Customers need to realize its all a game and shops can easily manipulate charges. The important thing as in any business relationship is TRUST. Find a good shop that you can trust. I've been in the auto repair business for over 1/4 century and have seen many repair jobs all the way through the person first calling to the final word. People who think diagnosis should be free and/or bring their own parts are almost never good reliable customers, and they are doomed to bounce from shop to shop, choosing their next mechanic based on how cheap an oil change is, if diagnosis is free, and if he doesn't have any other customers IN LINE when THEY want to pop in for a quickie-something, but NEVER HOW WELL-QUALIFIED OR EXPERIENCED. Mechanics who don't charge for diagnosis hear a lot of, "Thanks, now I'll pay MY MECHANIC to do the actual repair." or, "I'll bring it in next week some time for the repair" then you can follow them straight to the auto parts store. As for bringing one's own parts or diagnosis and SWEARING you just want the mechanic to do the work and you'll pay and be happy even if it doesn't cure whatever problem you hope it would- experience shows that people forget that the second work begins. Before the job is even finished, they'll start in with, "So, I'm not going to have any PROBLEMS after you finish this, RIGHT?" You start to remind that they just wanted the one part installed with no warranty or guarantee and they go full idiot and interrupt with, "OH NO! I EXPECT YOU TO STAND BEHIND YOUR WORK! (Then with the sanctimonious tone turned up to 11) THAT'S WHAT I'M **PAYING** YOU FOR!!" Putting aside the thorny issues of who is responsible when a "free" diagnosis goes wrong, it disgusts me to find so many people come in believing that what I do all day for a living has a market value of exactly zero. I don't know what business you are in, but tomorrow is my day to come in and have you do it for me for free, while I tell you how to do it! I took my truck to a Dodge dealer and they wanted $115 for the diagnostic. I told them I am not paying that amount of money to have them plug a cable into my truck. Good for you. You showed them! And the qualified automotive experts in the industry thank you for not wasting anyone's time except your own! Now "get in the zone" at autozone and buy parts based on their scan. No one is getting over on you! BTW where do you work, I'd like you to use your skills, equipment, and experience but not charge me anything. I'm also going to tell me dentist I'm not paying $125 for them to put a dumb camera in my face and take xrays. Thank you so much for your help!! Oh man bummer--I hate that! Come to my shop I won't charge you to plug a cable in. You bring the "cable" of course.. you're on your own after that, I have cars to fix. Just curious though, why don't you do it yourself? I mean, it's just plugging a cable in.. save yourself $115. Just to be on a safe side... Diagnostic should cost some money - it's the technician's way of telling us WHAT the problem is. If customer thinks he knows what the problem is then just tell the technician what to change and ask for an estimate of that work. If you want a professional opinion as to what the problem is you HAVE to pay for diagnostic. The problem I have is when a technician charges me the fee WITHOUT finding the problem saying that unfortunately he needs more time and more time costs money. This is what I consider to be completely idiotic... After all, I do not think that the very same technician would feel happy about sending an application to renew say a registration on his own car, only to receive a response that they would have to charge him DOUBLE now because they had hard time locating his information in the DMV database and spend extra time entering his new info... Seems silly, doesn't it? For example I was told today that a technician spent 3 hours and was not able to find the problem with a check engine light or whining noise from the ABC pump. The rep called me to authorize another 160 bucks worth of diagnostics. I said he was out of his mind and if by the time I get to the dealership the problem isn't determined, he won't even get the original 160 bucks. You're one of those people that thinks all problems are found in an hour. It's been 9-10 degrees out past few days. A lot of cars towed in. One particular no-start was a Dodge Caravan. 10 trouble codes in the PCM ranging from map sensor, O2 sensor, lean, fuel injector codes, etc etc. Technician knew couldn't be problems with all those parts at once out of no where, suspected a ground, wiring, or PCM fault. After about an hour and a half he found a section of the wiring harness that had been chewed by a rodent apparently finding a warm engine bay a nice place to be when it's cold. The harness ran along the bottom of the rear valve cover above the exhaust manifold, way out of sight. Essentially 3 wires had to be repaired properly, clear codes and monitor with scantool whilst driving to ensure repairs. Good luck as a non-technician finding that stuff on your own. If you can in a reasonable amount of time and make the proper repairs, you should be an auto technician, and can easily earn 100k plus in a busy shop. If the people at the parts stores that scan codes were any good, they'd be fixing cars, not a 25k a year cashier/key holder. Just sayin'. Another reason to secure diagnosis is for all the people that bring their cars in and when they find out what's wrong, suddenly their uncle/brother/boyfriend/girlfriend/neighbor is a mechanic and they can do it. Fine, no problem. Just pay me for my time/shop/expertise and be on your way..
By the way I am a fair guy.. you have no idea how many cars get towed in that are OUT OF GAS. I put a gallon in and it fires up. Technically, I diagnosed the problem. Customer argues "but it says 1/32 of a tank". OK. Didn't start. No fuel pressure. Add fuel. Starts. Wanna take it for the cost of a gallon of gas or should I start charging for my time??? Point is, when we find something very obvious we aren't here to beat people over the head. It's the tough stuff we have to make sure we aren't wasting our time, and I'd like to think most good shops operate the same way. Just had a customer come in because defrost would not blow air out of top of dash, only vents and floor. Secured diagnosis. Problem was a start-interlock device was installed by a 3rd party (blow n go--DWI)that physically interfered with the mode door actuator lever under the dash to the right of the steering column. Pretty sure "plugging in a cable" isn't going to produce a code/repair for "blow n go device hitting actuator--please find and move it"
Diagnostic fees are okay, but should be waived if you go ahead and have the repair done at the shop where the diagnosis was made. I worked at 3 auto shops in my late teen years as the oil/brakes guy. Trust me when I say mechanics are crooks. My advice is find a place with a quick $50 scanner, go home do some research and then find a shop and first thing you should ask the owner is if customer are allowed to be present in the garage during the repair. Leave if they say no. If they say yes, then watch the mechanics like a hawk. If your paying $100 for a whole hour of diagnostic, I would stand there until the mechanic is there working on diagnostics for a whole hour. You should even have multiple problems and have him check multiple parts. I've seen cars come in to be checked out for latterly 10 minutes and get charged a whole hour of diagnostics. I've asked why charge a whole hour to those that take 10 minutes? That's like charging people $600 an hour. Why even have a repair shop, we should make it a diagnostic shop. Answer I always got is cause their experience in diagnosing. He said it would take another tech an hour of messing around with stuff to find a problem that it would take him 5 minutes to find. I would say 9 out of 10 cars do not require even 10 minutes of diagnostics but they shop will charge the customer an hour. If you bring your car in to get your car checked cuz u hit a curb, most of the time the mechanic will put your car on the lift and spend 10 minutes looking at the axle. If you are not present, then that is where the diagnostic ends. If you are present, you can say hey can you look at this and that. Use up the whole hour. Each shop had about 1 out of 3 cars come back because of an improper diagnostic or repair. This one car came in for an engine light and his car ran rough sometimes. The "20 year mechanic" plugs in his computer and says there is a random misfire. He looks under the hood and starts to take off some of the plastic covers to see. It took exactly 10 minutes. He says there's an air leak, upper and lower intake gasket need to be replaced(900 dollar job. It's suppose to take 8 hours of labor and about $100 for parts plus the $100 diagnostic) It wouldn't of only been quick 10 minute diagnostic if the customer was present and did just a little homework like go to autozone where they will plug in the $50 scanner for free so he would have some general knowledge and go look up a few things on the net about the code and what can cause it. The customer pays. Less than a day later comes back and says he still has the same problem. The mechanic never tested his repairs. So the mechanic looks at his scanner again. Tries different things for half an hour and it was no help. Then he figured out that a coil pack was not working correctly. So he charges the customer another hour to replace the coil pack and 60 dollars for the part. Another $160. The coil pack is held on by 2 small screws on top of the engine. It took less than a minute to take the coil pack off and put a new one in. The customer was charged a whole hour ($100) and the car was actually fixed this time. He came up with a story told the customer something cause they paid and was a pretty regular customer. I felt bad cuz if the mechanic did the diagnostic right the first time and actually spent an hour that he was paid on the car, then the customer wouldn't of been charged $1000 extra dollars for his crooked diagnostic and it would have been only the coil pack cost and diagnostic. The car owner was not a wealthy man. If he would have stood there next to his car, watching the mechanic. The mechanic would had to diagnose the car for an hour and would have figured out that the coil pack was broken. Then the customer would have seen that the part was easy to do himself. It would have cost $100 for the diagnostic and $60 for the part. Gone home or replace it right there in the lot. Total of $160. Instead of the $1260 that he paid. I don't like getting ripped off and don't enjoy ripping off people. I would suggest everyone go learn what they can about their cars. There are many many small repairs that can be researched and done in an hour with $20 worth of tools from a store that shops would be more than happy to charge you hundreds of dollars to do. And STAND THERE next to your car. It's your baby. You wouldn't leave your baby for a doctor to check out alone would you? Oh and I don't care how much experience a mechanic has diagnosing cars. If I pay $100 for an hour of the mechanics time, he better be there for an hour looking at all the problems I have. Question... I am all about paying a diagnostic fee. I understand the shop has to make money and it takes time to figure out a problem. But how much time is too much time? My car needed a valve adjustment and my mechanic is charging me $400 for the diagnostic time and $450 for the repair. Is that normal? I have never been charged that much for a mechanic to figure out what was wrong. Easy solution to all this, if you don't like paying a diagnostic fee - then don't, there are lots of good repair shops that don't charge them, or waive them if you proceed with the repair. Am I entitled to getting a printout of the diagnostics that I paid for? When I asked for it, I was given the comment that their printer was broken. If this is the case, how do I as a patron know it was even ran? The item that was changed could be determined it needed repairs in other ways beyond running a diagnostics. Diagnostic fees are necessary and justified in most cases, last week when my car had a water leak problem I took it into an auto repair shop ( Apex automotive ) in Edmonton and they took almost 1-2 hours for finding leak. Similar cases like electrical and other major issues they may be unable to diagnose within a stipulated time. In that cases they may need some additional diagnostic tools. Hence, I think paying for diagnostic is 100% right. Totally missed the issue. Why should the customer pay for the quote? You want the work and business, complete the diagnostic then tell me whats wrong with my car and give me a quote. How can it be justified to charge a customer for the quote?! My mechanic was unable to diagnose the electrical problem, but still he is changing me for his time. Is this legal? I understand charging for diagnostics when the problem has been identified, but in my case the mechanic openly said, "I can't figure this one out, but I spent several hours trying, so I am charging you for my time." I have been trained on diagnosing car problems I have alot of people come to me to fix things the dealer cannot. They are more than glad to pay for the diagnostic fee then. I believe the diagnostic fee should be paid if the person doing the work knows what they are doing if not do not pay. Scanning a car and getting the code is one thing, but what next? That code does not pin point the problem and say replace this sensor. Take a lean code P0171 and P0172 I have seen this be a vacuum leak, fuel pump, dirty MAF sensor. I had to run checks to figure this out usually this code take me less than an hour. The other day had a customer bring their car to me, had it to 3 GM dealers for a Camshaft crankshaft coorelation fault code. I fixed it in roughly two hours and after they paid close to 2k for nothing yes they paid the diagnostic fee. Again if someone knows what they are doing to diagnose a car yes they should be paid. But the problem is how do you know if they know what they are doing and for the average person that would be hard to discern. The fee should be brought to the customers attention up front and paid if they know what they are doing. Good article. I took my Mercedes to the same dealer I have always used for service, and I have NEVER been charged for diagnostics before. This time they charged me $442.50 for diagnostics, which was $125 per item for 3 things I mentioned that needed to be looked into! They also charged me $67.50 for diagnostics on a windshield wiper fluid spray head that I told them was not working correctly. I tried nicely explaining that I should not have to pay for each thing I told them I noticed in the car. I feel like I would have been better off just saying "Something is wrong with my car, can you look into it? ", so the charge would only be $125! My detailed explanation seems to have cost me money and I was just trying to be helpful! since I am doing the $2K in repairs they recommended. However, I won't be buying another Mercedes, as this left me feeling taken advantage of. Oh, maybe I should add that the "recommended list of service items totaled $8,423.59, and they would only give me $5,000 on a trade in of a great looking 2006 Mercedes CLK 350. I am going to other dealerships next week! I can't get the service manager to work with me on these fees. Am I being unreasonable or are they? The part that's BS is when the mechanic doesn't spend more than a couple mins doing diagnosis, but then charges you as if he had done the 41 steps required to appropriately pinpoint the issue. They often seem to jump to the most expensive solution - ie. replacing the entire system, rather than the faulty part. WELL, CONGRESS STILL GETS PAID AND THEY NEVER SOLVE THE BUDGET OR ANYTHING ELSE, AND WE ARE STILL PAYING FOR IT. This comment is to the idiotic person who stated that you should be allowed to stand and watch a mechanic in the shop. Your off your rocker! First, no customer should be allowed to be in the shop area for safety reasons. If they get hurt.. here comes a lawsuit. No way! As far as the diagnostic fee, it's warranted. Though I believe the fee should be a set cost regardless of whether it takes the tech 10 minutes, 1 hour or 3 hours to diagnose. The better the tech the quicker they are. Plain and simple... Now back to customer being in the shop... The 2nd thing is this... Why should a shop take time to diagnose the problem, find what it is and have you refuse just so YOU can go home and change the part yourself. You call a mechanic a SCAM ARTIST.... So is them telling you the problem just so you can go do it yourself.... That's conniving and just as ignorant. True, there are a lot of SHADY mechanics but some customers are just as SHADY as the bad mechanics. Why would you pay for a test, when you ask them to replace the battery, why wouldn't they test this to make sure everything was working? Do Dealerships now just plop your battery in and that's it. If it works it works but if it doesn't you have to pay an additional for a test? The top won't go down completely after some work was done. The shop doing the work ran diagnostics and told us what the problem was. we took it to the dealer and they said they had to run their own diagnostics, $137, then they couldn't find the problem so another $300, Think they'll ever see the car again? I had many friends who were mechanics and all of them talked about the shady stuff they did to customers and the lies they told them. They worked for Chevy, ford and dodge. 90% of mechanics are liers. They want to be considered doctors and charge outrageous fees for everything. Your best bet is find a mechanic you like and the more you go to him or her the less they will lie and cheat you. Soon they'll be doing the right job for the right price. If you aren't in their system when you bring the car in you better believe they will try to up charge you for stuff because they think you will never be back since you never stepped foot in their shop before. I have had a terrible visit to my local ford dealer today. I brought it there at the appointment time and turned the truck over to them,3:30 minutes later they mention to me that they can isolate a possible wiring issue related the IMRC coding, wiring issue. When they brought the truck up and I noticed the truck had been siting outside as it was hot, they didn't even give me a cutesy wash and with there factory technicians and $ 100.00 diagnostic computer. BUL$hit. If I went to a dealerships service department, can I request a printout of the diagnostic report? Hello, as a customer of a dealership or independent shop, I suggest you ask for as much of the diagnostic info they can provide. Anytime they recommend a repair/service, they should have some fairly concrete evidence for their recommendations, and they should provide that to you. Evidence may be a printout, but it may also be a reading on a measurement tool, a visual clue (broken, sign of wear etc.) or technical info from the car manufacturer. In short, always ask them, "What led you to make that recommendation". i have a 2005 corvette.the heads up display is not working.i brought it to a chevy dealership.i was told they would have to run a diagnostic test.i paid 150.00 dollars only to have them say the whole dash has to come out for more diagnostic testing. I still disagree with the notion that paying for the diagnostic is inane. I do computer work, and if a customer comes to me and tell me "their computer is slow" or something more precise like "my hard drive isn't being recognized", I can't tell them that they have a lot of bloatware/malware on their computer or the hard drive is broken and charge $200. That stupid in practice, and people will go to less for it. Especially with the high end prices that places charge per hour. There's a shop close to me that only charges $30 an hour, and it has some of the best mechanics I've ever met. Not to mention you guys markup prices on parts by 250%. A $5 to you is a $30 to them. Now, if you had fixed the issue and replaced the whole thing, I can see the justification in charging that amount + the price of whatever it took to fix it. But to charge someone for something they already know without telling them whats wrong with it is stupid in practice and you will go out of business if you treat your customers like that. My gripe is when the dealer/repair shops throws out the "Could not duplicate." in that event yes, they spent some time. But in many cases they technician was unable due to skill, available access to TSB's or recalls, or other reasons to not be able to root out your problem. If a dealer is unable to fix your car then I absolutely feel you should not pay a fee. If the gentleman who said he already knew what was wrong, WHY didn't he fix the problem? Mechanics need to locate the problem before they can repair it. "Time is money, I'm sure that gentleman has heard that phrase befors. Doesn't the flat rate already include diagnostic time? If so then I am paying double. I did not find time to read all wonderful comments. But I have old car Chev 2001 , 220000 miles. and it worth less than $500. The starter key doesn't work will and I need to replace all the entire parts to make the starter key turn on the car. To replace it they ask me for $450, I said no, so they charge me $100, I shocked. And I'm so upset. If it is worth ok. But old car. just got charged $196 for an ecc diagnostics today at Galpin Ford. $196!!! I was stupid. Well I just got back from a GMC dealer automotive tec to get my safety check an I had miner problems. Like a light "for example"for my rear window lights. An they don't make them anymore they asked me if I would like them to find the part? An even if they don't find the part. I would be charged 80 dallaors. I mean how would we know if he even tried to find a after market part? An what got to me mad! They said even if I have only 3 lights that r not working they would change for all 8 lights. " they only sell it in 8 pack" plus labor for fixing it. an I would be charged for a set of 8 light not 3. So explain to me why autozone will run the scan as a free courtesy? A service center of the dealership of the car we have purchased charges, but an auto parts store who has not already made $20k - $60k off of us gives the service away free? How does that make sense to anyone. "So explain to me why autozone will run the scan as a free courtesy?" There is a difference between someone showing you the diagnostic codes stored in your car, and performing the appropriate diagnosis to identify exactly what is causing the problem. For every code stored there are several possible solutions. So, having the code narrows it down considerably, but it is not a "diagnosis". The pretentiousness of a lot of these mechanics here speaks volumes really. Customers pay huge amounts of money for these cars, most times well over what it costs the manufacturers to make. When someone pays an additional cost for a manufacturer's warranty, then it shouldn't even be a discussion that diagnostics come for free during the course of the warranty. A warranty is not insurance, you don't owe a deductible. A warranty is a guarantee. There is no practical reason a customer should have to pay a $100 diagnostic fee under a manufacturer's warranty. If something is wrong with the car, the manufacturer should be eating that cost in that circumstance. Volkswagen Canada charged me $120.00 to tell me they couldn't figure out what the problem was and I would have to pay for additional diagnostics. How's that for service. No one expect you to work for free. You should get paid according to the service you provide not the years it took you to become a mechanic. Please do not compare what you do to what a physician does. Only a simple minded person would compare human body to a car. The real problem with charging for diagnosis is human greed. It encourages you to charge for diagnosis every time even if you are 100% sure what the problem is. So if you still insist to compare yourself to a physician, how would you feel if Your Dr ran number of tests and X-rays every time you had flu? No one should have to work for free. The person was too cheap to pay for the repair. Would you come to my house and work for free???? I totally understand and agree that a professional should be paid for their level of training and expertise. However, there's no denying that there is significant widespread abuse of the fee for service ideal. For example, on average, a doctor after completing medical school makes $60-$90 an hour depending on location. In most first doctor visit, a patient does not know is wrong with them and the doctor is paid to diagnose and treat the patient. I'm in NYC and Kings Chrysler Jeep Dodge charges a fee of $260. to diagnose a vehicle. I'm all for the technician being compensated, but to me $260. for less than an hour for you to tell me something I already know is beyond BS. But isn't the customer being charged a per-hour labor charge?? If he had decided to employ your shop to fix the issue, would you have charged the labor charges as well as the diagnosis fee? If the fee is absolved in the repair costs, I agree and well done. But it's when the dealership refuses to waive the fee, and charges an hour of labor, plus the diagnosis fee that is absolutely wrong. Smarten up America and stop being taken advantage of by unscrupulous dealerships. Well, let me start by saying I shouldn't be surprised to learn of a dealership unjustifiably charging un-bona fide fees in their service departments. Recently, on 30 degree day, my driver side window became inoperable and was stuck in the down position. Given my proximity to the ***** Ford dealership, I decided to stop in and see if they could help me get the window back to a closed position and remedy the issue that rendered it inoperable. Before pulling my truck back to the garage, I asked for an estimate of costs to replace the power window motor, if needed. It was explained to me that Ford will then charge me an hourly rate for the technicianâ€™s time, in addition to a $74.99 diagnosis fee to decipher what needed repair. This struck me as oddâ€¦ I was to be charged a diagnosis fee ON TOP of the hourly labor charges, when I was employing them to fix the issue. I explained I would understand that charge if they determined the cause of the issue, and then I took the vehicle somewhere else for repair. When I asked if this fee was absolved into the repair costs (parts & labor) given that the dealership was indeed employed to fix the window, and was told no, and that it's a standard fee and would be charged regardless. It was further explained that the fee contributes to the technicians pay, in which I responded - then why an hourly labor charge? To which she could not explain. Again, I shouldn't be surprised. Since when does a company get to arbitrarily add "fees" for "diagnosis" of an issue they are to be paid an hourly rate to fix? I offered to pay the technician for the hour it took him to figure out the issue, and the hour it would take to replace the part. This, of course, was not acceptable to the dealership and I left without assistance in resolving the issue that rendered my power window useless. I just couldnâ€™t understand why I would pay an additional $75 for the technician to use his brain to think through an issue, I was already paying him hourly to fix. Once home from work, I was able to remove the door panel, and quickly discovered that the cable within the power window regulator had become frayed and after some time, eventually snapped. Although I could hear the power window motor running, the window did not move. These symptoms alone would've made it fairly easy for an experienced technician to quickly recognize the issue rendering the window inoperable. It took me, of average intelligence and no ford technician training, all of 16 minutes to remove the door panel and identify the issue. When I called the dealership back to inquire about the diagnostic fee being waived since I have uncovered the very obvious issue, I was told it's up the technician and that most agree they deserve they additional $74.99 to trouble shoot issues they're being paid hourly to fix. If the technician knows what page of the repair manual to reference first, they MAY waive the fee, but itâ€™s up to the technician. I believe the gouging at dealership service centers has gotten out of control, and this is a prime example. Thus, I should not be surprised at the events that transpired. If anyone can help me understand the justification for charging customers twice for the technicians time, Iâ€™m all ears. I completely understand a diagnostic charge, as your time is not free any more than mine is. Once a diagnosis is determined, and decided to proceed with the repair in many cases part of the repair labor estimate has already been performed as a part of diagnosing the problem to begin with (ie removal of parts to access the part in question, etc). In these cases where the diagnosis labor overlaps the actual repair labor, customers should not be double charged on the labor component. Excellent explanation Diagnostics is a tricky one in terms of explaining and the customer understanding. "We sell service"
Uh, if I'm paying you to tell me what's wrong with my vehicle, I need more than just "your seat is broken". I need, what part is broken, and what's it going to take to fix it price wise. In other words, I need everything broken down to where if I can fix it myself I will. This in my mind would be fair as to why I'm paying for a diagnostic. Diagnostic is defined as "able to distinguish" so the mechanic should be able to distinguish the exact problem and relay that problem to be exactly, not by generalization. What a ripoff!!! It interesting to see what non-professionals think and often how little they fail to appreciate that if it was so simple, why did they seek out professional advice. Scan tools like any other tool run from cheap junk to extremely pricey, and on scan tools there are yearly updates. Certain parts stores will read your codes for free, but many of those doing the scanning do well to know how to plug the scanner in much less make an semi-accurate diagnosis as to what exactly is causing the code and what it will take to correct it properly. Will the customer work for the employer gratis, no. Where does the employer make the money to pay for this, raise the price on those wanting to have their vehicle tested and fixed, I hope not. I've been working on cars for a long time, backyard mechanic style. I own a 2013 Hyundai now... my mistake was thinking my skill set applies to as many things now as it did on say, a 97 Integra. It. Does. Not. Now I'm off to the dealer, after spending $1000 with a shop "mechanic" who wanted to replace parts to see if it fixed the problem (at my cost). I should have just paid the F*N diagnostic fee FIRST!!!! If you have a car past 2010, don't mess around. Have them DX, pay them, fix it yourself, then pay them to clear all the codes you're going to thrown when you fix it. Cars are a scam. I've worked exclusively on Mercedes-Benz for 50 years. I just got a call from a argumentative young man who couldn't understand why we charge $129 to diagnose his Check Engine light. He bought a $20 scanner at the parts store & doesn't understand why we charge so much. The Mercedes-Benz factory Star Diagnostic system cost us $25000 to lease from MB. The software updates cost $7500 per year. Access to "startekinfo" cost $60 per day. I pay the mechanic about $75 per hour with benefits. This may sound harsh to some, but I've had my fill of Dime Store millionaires that complain about the price of repairs on their Mercedes-Benz. I've weeded out the deadbeats & we have a group of customers that have already been through the dealer wars & are glad to have someone competent working on their MB. I had a guy get mad last week & peel out on our parking lot because we wouldn't use his ebay parts. These cars are insanely complicated. We hear from these dumb bells after they screw up their electrical systems and then try to make us feel guilty for charging for our work. It's a little game they play, because they've been lead to believe they're entitled to a "free" life. Last Christmas Eve I waited until 7:30 for a first time customer to be towed in. I gave him a free estimate because I knew what was wrong and I wanted to go home. He wanted a written estimate with part numbers. I did, & charged him $129. He shopped the price & found some Russians that would do it for $200 less. He posted his "discuss" on Yelp & refused to pay the $129. I'm actually thinking of getting a unlisted phone number and only deal with known customers or their referrals. As a shop owner to the customer's that feel like they shouldn't pay a mechanic to tell them what's wrong with their car. We're actually busy every day with customers that we don't have to fight with & explain how the world works. Most of our customers are actually glad to have someone explain their problem and fix it right the first time. You & your broken car are competing for our time with our existing customers. For years, our existing customers have been paying the overhead for our business. I know them, their kids, their dog and their car. I don't even have to call them before I fix their car. They trust us & I trust them. I actually like 99% of them and consider them friends. Now you come in and want us to stop working on our friend's cars and help you, for free. We get to listen to your complaint and see your negative review on Yelp, for free. I'm sorry, but if our knowledge & time is worthless to you; please, do us a favor & let someone else listen to your complaint. Believe me, no mechanic cares if you want to go someplace else that works for free. I might suggest taking your car to the person that told you mechanic's should diagnose your problem for free. Let them diagnose it. The customers that have been loyal & supporting us for years, have paid for my undivided attention. I know, you're special. Why would you ever be my loyal customer if I don't diagnose your problems for free? You actually think you deserve to interrupt the work day and use the equipment & facilities that someone else is paying for with their hard earned money. I'm sorry your teachers & parents never told you any of this. Mechanics don't work for free; unless you're my loyal customer. You would be amazed at what I'll do for them. I wanted my car to fix the probelm for engine stalling i faced multiple times in last few days. I took to reputed repair shop and they offered me initail diagnosis and they come up with all recommended repairs like tire change, oil change, transmission fluid change etc. and when I asked about particular problem of engine stalling. their view "it might be distributor or cam valve" however they did not able to duplicate problem i.e, did not find single time engine stall during 2 days when car was in shop. Now my question is what should I do, should I just pay initial diagnosis charge $100 and still not knowing/fixing problem or just go ahead with wild guess and change distributor or cam valve as they suggest. I was told nothing wrong with my car and then before leaving I went to get in my car and that's when service guy saw and heard there was a problem with my car.and asked me to bring back car in morning when they opened. They after 2 days of car rental and my warranty covering all repairs. They want to charge me diagnostic! I am upset cause if they would have properly diagnosed my car first time which was day before it wouldn't be a issue but they gave me paper work saying my car was fine. With exception of defect on seatbelt and recall on my brake booster. I understand that labor is involved in diagnosis. But what if the labor runs up over $300 because the mechanic decided to "over-check" (i.e. not try the simplest most common fix). Here is my dilemma. I took my truck to my local mechanic because the inside lights do not come on when the door is open. The manic calls me saying they need more time to figure out whats going on and more time equals more money. So far, they've looked at my truck for about two hours and I owe them 120.00 dollars. I get that the guy spent his time and tools for two hours and I completely agree they need to get paid for this time but there should be some middle ground when they cannot diagnose the problem. The way I see it is that I spent 120.00 for them to turn around to say that can't find the problem yet. I'm 120.00 short and no diagnostic. So who is right and who is wrong...? I would had felt better paying the 120.00 if they actually did find the problem. Just my opinion. I love it! Comparing good technicians to doctors? Hopefully not? Most doctors spend 5 minutes with you only to write a prescription for a med from they're favorite golf buddy , aka pharmaceutical rep Happens to sell. Then after a few weeks you are now off for blood tests and some scans. After a few more weeks of serious health issues your symptoms have snowballed . And when you find that pneumonia was your problem all along, there are no apologies from a doctor, also every visit or test has cost a boatload of money to you or an Insurance plan. Now there are plenty of good doctors among the bunch and I can respect schooling cost , insurance for practice etc..... Now, to the last comment about grease monkeys, I need to to know what you do everyday for a living? The grease monkey comment may be valid if you have had bad experiences at shops, however most shops we know actually repair cars and stand behind what was diagnosed or repaired. If you frequent the chain stores because you are a coupon chaser or you only deal with the guy down the street who will touch your car in Exchange for beer then you are excused for assuming all technicians are just grease monkeys from Mayberry! For other comments, the code that auto zone pulls is just a code, pulled by guys who install batteries and wiper blades ! The code simply gives us a starting point. If you were to have a code p0300 for a generic misfire then at home you will replace all tune up components, maybe an ignition coil, then a fuel injector or two until you and your beer buddy are stumped and broke. Now it gets dragged into us to figure out, I charge 1 hour for a misfire diagnosis only to find that the crankshaft sensor is going bad. " funny that the code does not say crankshaft sensor anywhere". I charge $91 to figure this out and another x for parts and x for labor to replace . If you do not want it repaired that is never an issue, take it home and do it yourself as its not typical a hard job. Just pay me for my 1 hour. We deal with great people all day and there is always one person who likes to get angry at a diagnostic charge but I stand behind what I diagnose and will actually refund that job if it does not fix the problem. Not to mention how different that code is from a Nissan to a Buick to diagnose. How about the battery drain that takes us several days of off and on testing to figure out because it is intermittent? I do not charge for the lost time on that job. How about in my situation. Went to the dealership for a check engine light on. Repairs were done as it was a manufacturing part fail. Dealership ran codes and stated all codes were clear. I also had a repair done that wasn't covered by the manufacturer or my self-pay extended warranty. Left the dealership after 5 days in the shop and drove home about 40 miles. Car sat for 2 hours and when I started it up again, had the same problem. Check engine light on, hard engine start, throttling, smoke coming out back. Dropped the car off next day. A week later and car is still at the shop. This whole week I haven't gotten a return phone call from the dealer about an estimate for the repairs or status. Car has been there all week. I did get in touch with someone and the only info he gave me is I will owe the diagnostic charge. Audi charges $150+ I believe. Should I have to pay this or is it something that should've been detected prior to my car leaving the lot after the first repair? help please!!! I have read a few comments from consumers and the auto-repair guys. The problem stems from distrust. We consumer have the feeling that autorepair guys just look for ways to get as much money out of you as possible. They come up with all sorts of suggestions about other parts to change when you only came in for part B to change. For the diagnostic fee, my concern is that I end up paying more for a repair which actually was just a $30 job. So I am unable to accept to pay $140 (diagnostics fee around Concord, CA) to get a $30 repair done. And there is NO "consumer friendly" repairman out there that you can trust. I don't buy all that bull about "I have to pay for my technicians, their certification, their insurance and so forth. That is NOT my problem. You can not dump that cost on your consumer. That is unethical. Every business has to "invest money" to get more business. These come under expenses. This expense can be for marketing your services, certifying your labor, hiring more labor etc. You can not lump these costs neatly into a $65/hour cost and then justify a diagnostic fee with that. This is your cost. You need to pay out of your own pocket. We all do that (those who have businesses or not). Why should you be an exception? You charge $25-50 for oil change and you get so many thousands of cars per month. Then there are other repair services. It seems to me that majority of the repair men want to transfer all the risks to the customers. And what if that diagnostic does not pin point to the real problem? This can result in very unsatisfied customers. This is not right. By requiring to pay for "diagnostics" (whether or not consumer wants it), you are establishing monopoly. Whatever happened to free market. If you are an experienced auto-repairman, you don't need diagnostics. You should know by experience that a certain defect is caused by a certain part and NO, I won't pay you for your time. This is just another cunning way to rip customers off. We pay you per repair. How long it takes for you to figure out the problem and fix it, should be dependent on your expertise. We should not pay for that time spent figuring out the problem and then fixing it. if you pay a diagnosis charge and they replace the part they thought was causing then problem, should you have to pay another diagnosis a week later when that part did not fix the problem. why does the dealer add an EPA fee to the diagnosis fee, what is the hazard waste there. This is a good one! A couple weeks ago I had a flat tire with my ford Edge. I put the spare tire on it and the idea was to go to a tire shop to get it fixed. When I started driving a warning light came up that told me that the car needed attention. Since I never had that warning before I was pretty sure it had something to do with the flat tire. But I thought, I might as well go to the ford dealership and tell them about this and they can also fix my tire. I arrived there, explained what happened and the service person told me that she was 100% sure it had nothing to do with the flat tire. She also said they need to put the car onto the diagnostics computer to see what was really wrong and, she also said right away that the price to do that would be $100. She also said right away that if the computer could not find anything, I still had to pay the $100. That sounded to me like very strange she said all that, it felt like they did that before, the computer found nothing but you still have to pay. Before accepting the diagnosis, I went back to my car and noticed that the warning light was no longer on. I told that to the service lady. Her answer was that if the light was on before, there is something wrong and it could be something really bad she said. She scared me there. So I said yes, do the diagnostic test. When I picked up the car 8 hours later, what I suspected came true. The service lady told me I was lucky, there was nothing wrong with the car. They fixed my tire and I had to pay $125. For the diagnostic test and the tire fix. When I complained about the $100 dollar she said :"I told you this could happen but you agreed to do the test" if I did not pay, they did not want to give me my car keys. So I payed and left. I think this is a beautiful example of a rip-off by the dealership. Would there be anything I can do? I'm an auto mechanic of pre 1970 vehicles (so I have to actually diagnose without a computer) and I took the 2006 Expedition to the local Oreilly's to get a free diagnosis (rough idling problem) and it showed nothing. I then proceeded to the local Ford Dealership where their PR tech gave me the speel about inferior scanners used at Oreilly's. The Ford Dealership's showed the exact same results... nothing.. and now they still want to bill me for hooking up the scanner for a fee of $85 when there have been zero results and they did NOT take it for a test drive. I have to conclude that mechanics today only know how to read and replace and not diagnose as I do on the older vehicles I work on and restore. I took the 2006 Expedition to be worked on at the Ford Dealership because I bought an extended bumper to bumper warranty and wanted to have a warranty with any work/repairs done to my own newer vehicle. I certainly hope that as technology advances in the automotive field that they mechanics also advance... not just in their abilities to "read and repair only" but also in diagnostic abilities. To understand what each part in each system does as we had to learn when I went to automotive school back in the early 80's after High School. I can't warranty my own work, I can just do it over again if I do something wrong, but I can warranty the work I do on the older vehicles I repair/restore because I am very familiar with what each and every part in every system does and how it functions and how it relates to other systems, making the problems very easy to diagnose. Say your brake light switch is broken. If you know next to nothing about cars, you probably haven't even heard of a brake light switch but I can promise you they exist. All you know is your brake lights aren't working and would like to have someone who knows what they're doing figure it out. Given the fact that in that case all 3 of your brake lights will not work, that would be my first guess, I'd pull the switch out and test for continuity. Show of hands here, how many people commenting about how they don't understand diagnostic fees, would know how to do that or even where to start looking? My guess is not very many. Say you took your car to a shop that intends to charge for their time to figure out your issue regardless of a repair being made and you elect to not have the repair because they want too much to change the switch out. That's all fine and good but you still asked a professional to figure out what's wrong with your car and in that particular case, you'd at least walk away with knowledge of what needed to be done. They didn't fix anything, but you walked away informed. That is a service and yes you should have to pay for that, the same way a doctor doesn't magically make you better but will give you information to help you get better and a lot of times charge for just that and nothing else. It's a combination of you took up a professional's time where it could have gone elsewhere and were given information to fix the problem. They didn't give you anything tangible except information. I agree if you go in for a check engine light and they say loose gas cap and it wasn't that, I'd have them do another diagnostic and tell them I'm not paying for it, and I myself am a mechanic, because that tells me they didn't look into the problem properly the first time and gave you bogus information, a potential lawsuit worthy mistake in the medical world. We own a garage. Our hourly is $70/hr, half hour minimum. We charge $70 to plug in because what we use and what a parts store uses for free is not in the least bit the same thing. If they decide to do the repair within thirty days, we will take off that amount if the amount is $300 or more. We absolutely believe that diagnosing the problem should cost money because it's our time, equipment and research. Most of the time people are fine with the fee. Every now and then someone will decline and end up taking it to a parts shop to scan it. The shop will tell them '(whatever) is coming up as failing'. So they come back and ask that part be replaced. You saved yourself a diagnosis fee, but telling what the problem is instead usually backfires. You just insisted we replace without diagnosing, so now that parts failed again because something else is what's causing it to fail. Now you're paying the diagnosing fee AND paying for the work to get done twice because you declined a diagnosis and told us to repair the part, not the problem. A $250 bill may only have 1.5 hours of labor on it. We can't discount all but .5 for diagnosing. If it's a larger repair, we'll be more than happy to take off the cost. But we have a lot of costs to keep our doors open. We have expensive (to us, at least) equipment and we have to pay to keep that equipment up to date and pay for different programs to ensure we give you accurate information and accurate estimates. We are also a one man operation. One mechanic, two bays. When you pay that $70, it all goes to keeping our business afloat. There is no big guy tossing money into the air and laughing. One owner/mechanic. We charge what we need to in order to stay open. It may take a few minutes to get info from the computer, but that points us in a certain direction. There is so much more to it than a computer telling is, 'do this because this part is failing.' I wish it would do that, but alas. And to the guy telling people to demand to watch repairs being done, seriously? They are not legally allowed back there and no matter what business someone is in, it's going to take them twice as long if someone's watching over their shoulder. Are all of you other commenters mechanics? This question is a load of crap! I pay for value. PERIOD. It is valuable to know what is wrong with the car if I choose NOT to fix it and I should pay for the diagnostic. If I choose to conduct the repair, knowing what is wrong is the responsibility of the repair shop and of value to THEM because they can't fix it unless they know what is wrong. In this case, what I pay for is EXPERTISE and not information. I also pay for time, figuring out what is wrong may in some cases be a factor of increased evaluation time. This is when a problem is unknown. I pay a rate that differs from mechanic shop to mechanic shop based on the value they hold on their expertise. If I am paying that labor rate it presumes that they have expertise in what I tell them is wrong and do not need extensive evaluation and diagnostic time. If I say that X is wrong, there are 3-5 reasons why X is wrong which the mechanic should begin to evaluate based on EXPERIENCE and EXPERTISE. In this case determining the problem is part of the labor cost of fixing it. Diagnosis should take only a few minutes. (let's be generous and say it takes 30 minutes of actual labor, I have seen times it takes 1 to 10) If the shop labor rate is $80 per hour the diagnostic is figured in and I should not be charged a standard $96 just because the mechanic has the tool. If you don't have the right tool, don't get into the car business. If after you tell me the thing is wrong and it took you 30 actual labor minutes to diagnose and then I REFUSE service, I think you are justified in charging me the $96. I would consider it a 1/2 hour labor charge and a $56 EXPERTISE charge. If I choose to repair the vehicle EXPERTISE is expected to be included in the hourly labor rate for the repair.